Will Seth Rogen and Judd Apatow’s new flic deliver? Stoner ... Action ... Comedy ... Wha? Directed by David Gordon Green. August 2008, USA. R: 111 min. While enjoying a nighttime toke in the driver seat of his old beater, Dale happens to look into the second story window of a posh mansion to witness a shooting. The perpetrator turns out to be a crooked cop and drug lord who doesn’t take too kindly to the idea of being caught red-handed ... which kind of begs the audience to ask, “Why the hell didn’t he just close the drapes?” No matter; what’s done is done, and soon the drug lord has turned his assassins on Dale, with the roach of pineapple express he dropped at the scene as a lead. If the trailer can serve as any kind of indication, hilarity and explosions ensue. 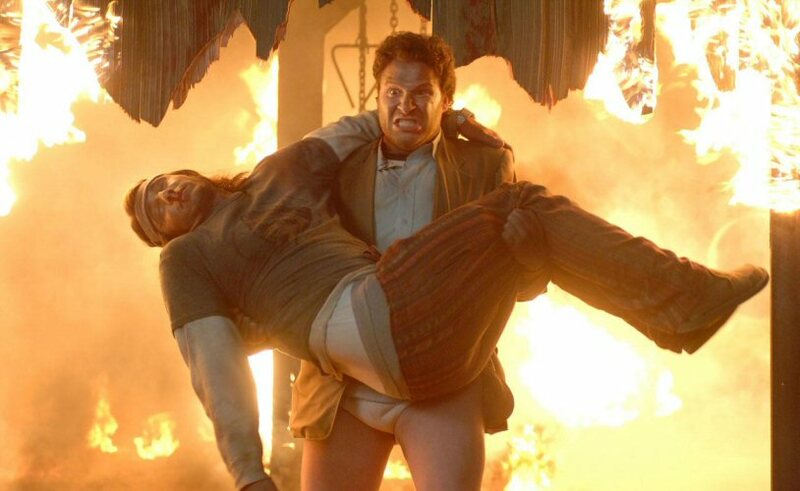 This new action-comedy direction — standing as a kind of American answer to the success of the British duo of Edgar Wright and Simon Pegg (Shaun of the Dead, Hot Fuzz) — will hopefully bode well for Rogen and Apatow, both of whom took an unfortunate step in the wrong direction with Drillbit Taylor. The movie, ultimately a watered-down, PG-13ized version of Superbad, left me to question whether or not Rogen had any good ideas left. I’m thinking those fears born of March’s failure will be put to rest by early August’s success.